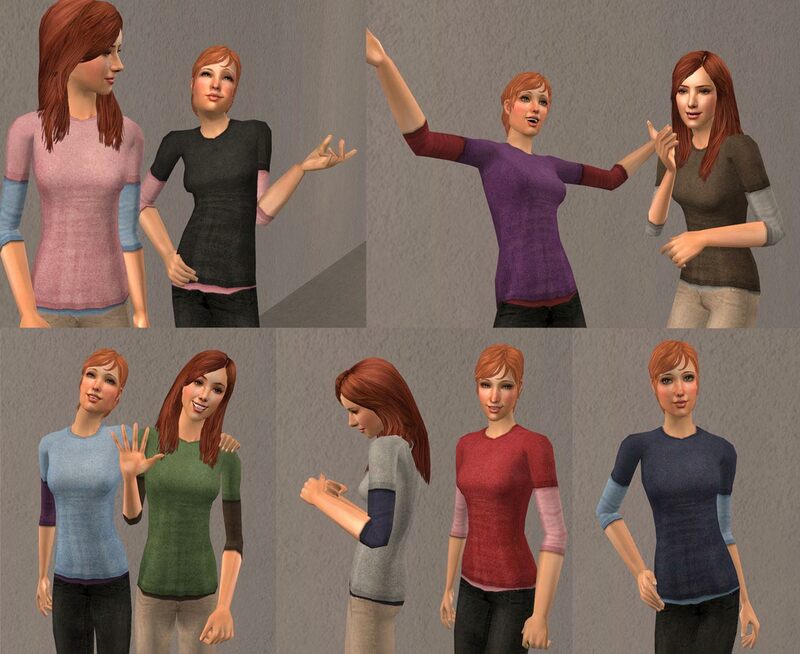 The Fanseefem project is my effort to bring normal clothes to our adult female sims. Sick of high heels, dressy clothing dripping with jewelry, and a lack of nice, sensible, basic clothes for females to putter about in the garden, I've gone a bit crazy. This is the first installment in hopefully what should be a multi-part series, attempting to provide some simple stuff that normal girls can wear every day. Because of the scope and grandeur of this project, I do not have any plans at this time to do the same for teens. Please don't ask - I may if the mood strikes me, but I hate doing stuff over, and doing the same huge pile of stuff again is enough to drive me batty. Untuckable Top Mesh: - Close-fitting top mesh with a smooth shirt front (no underboob crease) and a smooth waistline to allow for untuckable tops. Slouchypants Bottom Mesh with Boots: - Slim but comfortable fit jeans mesh with slouchy bottoms at the ankles, with nice sensible boots. Slouchypants Bottom Mesh Barefoot: - Same shape as the boots version, but without the boots, so your sims can go barefoot in their new jeans. All meshes include a fat morph that is the same size and basic shape as Maxis fat. 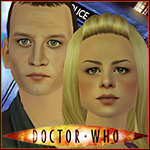 Updated 19 Mar 08: All meshes now include pregnant morphs so they can be used for maternity wear. You will need a hack (like Pregnancy Wear Any Outfit by Squinge) to use these as maternity wear. You only need to redownload the meshes themselves and replace your existing files in your Downloads folder with them - all recolours (mine and those made by others) will still work on these meshes without needing updates. The files have the same names as before, so just extract them to the same folder and allow them to overwrite. 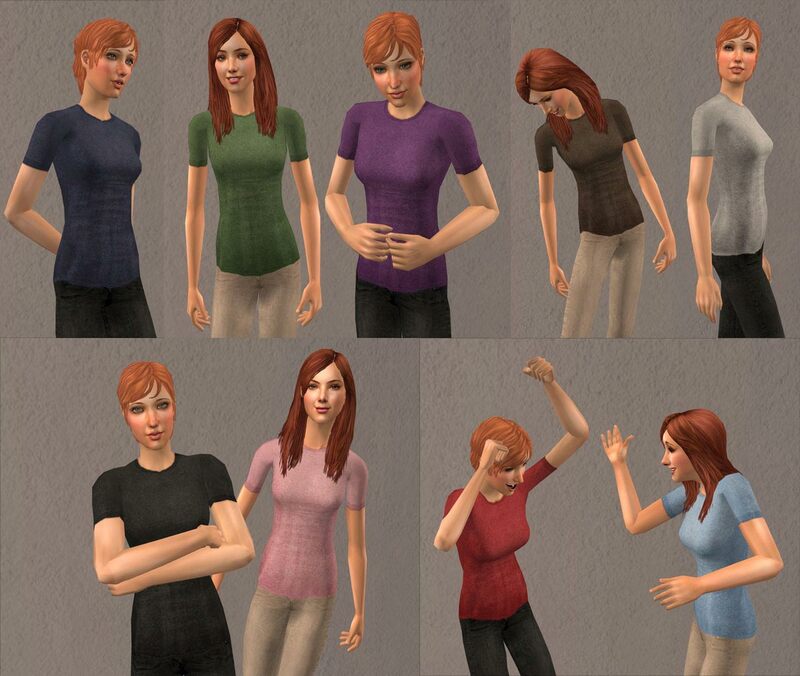 81 Untuckable Shirts (All require my Untuckable Top Mesh): These will work with any Maxis bottoms and will look as if they are tucked in - even on pants that normally show the midriff/belly with Maxis shirts. This means no more bellies showing no matter which bottoms you choose to pair them with! However, if you use them with the special untuckable recolours of the pants that I've made, you'll get a cool effect that the sim's shirt is untucked. 9 Tank Tops: Well, maybe not actual tank tops. They're more like sleeveless tees. 9 Tee Shirts: Like the layered tees, only with no 3/4 sleeve tee underneath. 9 Longsleeve Shirts: Full wrist-length tees. 54 Layered Tees: 3/4 sleeve tee under a regular close-fitting tee in a ton of combinations of shirt and sleeve colours. See the attached pic with the many many swatches for a full list of all the combinations I did. Yeah, I know, 54 is a ton, but I -really- like layered tees. 32 Slouchy Jeans: Each of the colours of jeans comes in an untuckable and tucked version - the untuckable versions are meant to be worn with my untuckable shirts - without them they will look... well, utterly awful (takes plumber's crack to a whole new level), but the tucked versions can be worn with any shirt. 16 Slouchy Jeans with Boots (Require my Slouchypants Bottom Mesh with Boots): Features a smooth waistline for proper untucking, and handmade textures - the blue-grey version is taken from pictures of my favourite set of real jeans I own. They are paired with nice comfy boots that will be great for digging in the garden or having a barbecue - see the pic for the colour of boots each set has. 16 Slouchy Jeans with Bare Feet (Requires my Slouchypants Bottom Mesh Barefoot): Same shape and texture as the above, but without shoes. Absolutely everything is clearly labeled so you can remove any recolours you may not want. It's all separates (top and bottom) so these will only show up in the everyday category. Everything works for adults and young adults. First and foremost, a HUGE thanks to the incredible fanseelamb. I have used her textures for the tops, in some places with a bit of recolouring/editing, but in most places taken directly from her untucked tops (and the alpha for the untucked pants from her untucked pants). And the whole idea for the untucking stuffs in the first place. Go see her profile for similar stuff for males. She was the inspiration for this project and deserves thanks and cookies. And beenz. Big thanks also to Nouk, for talking me down when I realized I'd accidentally imported two skeletons into my main mesh file, and to Tiggerypum for everything she's taught me about meshing. And also a big thank you to the rest of the MTS2 staff (especially Delphy) for making a place where I can learn how to do cool stuff like this, and share it with all of you. Major adoration and thanks furthermore (and especially) to Wes_H the Unimesh plugin and his new Fist of Frankensteining - it made this project doable and enjoyable. Thank you, Wes! I'll probably be doing more kinds of shirts for the untuckable top, and maybe more kinds of pants. I won't be doing more recolours of these particular textures. You are welcome to do so yourself, though. If you recolour the tops or use the alpha from the pants please credit fanseelamb with a link and her name. If you recolour the jeans please credit me for the textures, and fansee for the alphas if you do more untucked colours. Make sure to link back here to this post so people can get the mesh - do not include my mesh with your recolours. My other normal policies still otherwise apply. Please see my profile for details on using with sim uploads and suchlike. Please make sure you download the meshes! Get my top mesh if you're getting ANY of the tops here, and the proper mesh for whichever set(s) of bottoms you choose - either barefoot or with boots. The meshes are separate from the recolour files (clearly labelled) and you will need to get them too for these to work in your game! SimPE, Milkshape, Unimesh, and Fanseelamb! 16 Untuckable Tees for Young Ladies! 6 Untuckable Graphic T-shirts for Females. Untucked Jeans & Cardis - Redownload if you have had problems!!! Rainboots Galore - Plus bonus! Set of 14 Untuckable U-Neck Tops for Ladies! Little Miss Tees for Adult Females. 80sTees. Some fun re-textures of HystericalParoxysm's untuckable mesh!!! Forever 21's Polka Dot Tube!! Forever 21's Girl Glam Tee!! Smile if You're Gay! Cheery Yellow Tees for the Laydeez.